Making your own stock makes all the difference to home-made soups and casseroles. It just feels good too! Now with a few extra ingredients and a little longer on the boil you can make a nutritious broth to reheat and flavour as a daily health hit for your gut. Simmer for 6-12 hours (at a low heat) in either a slow cooker/crockpot or in a large pot on the stove top. The longer you can boil the broth the more nutrients will be released from the bones and meat. You will find a longer cooking period will elicit a broth which is gel-like in consistency when cool (that's good). Strain veges and bones off so that you just have the stock remaining. Leave to sit so that the fat rises to the top of the broth and sets. Scrape fat off and put aside for cooking with over the next few weeks. Now store the broth in the fridge for up to 4 days or freeze to keep for a longer period. Serve a cup at a time, heated. Add salt, pepper, turmeric, ginger, or other flavours of your choice. Note the basic broth is not particularly tasty and benefits from added spices and flavours. 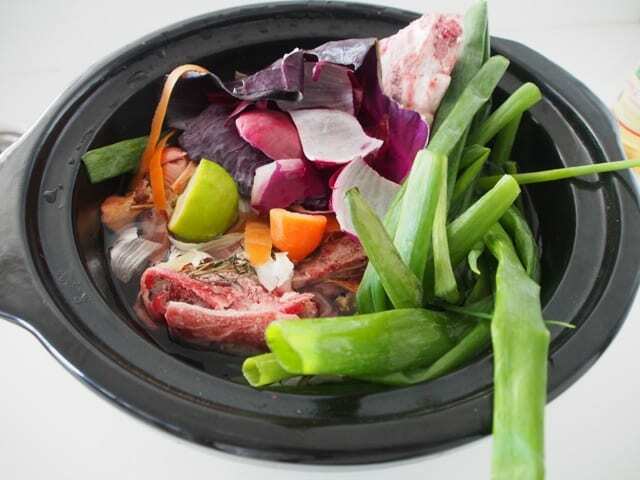 Save all of your vegetable off-cuts over the week and use in your weekly stock. This is a great way to recycle you vege scraps.